Although somatically mutated autoantibodies are characteristic of many autoimmune diseases, the processes that can lead to their development remain poorly understood. We have examined the formation of autoreactive memory B cells in PevHA mice, which express the influenza virus PR8 hemagglutinin (HA) as a transgenic membrane bound neo-self-Ag. Using a virus immunization strategy, we show that PR8 HA-specific memory B cell formation can occur in PevHA mice, even though a major subset of PR8 HA-specific B cells is negatively selected from the primary repertoire. Moreover, PR8 HA-specific memory B cells develop spontaneously in TS1 × PevHA mice, which coexpress a transgenic PR8 HA-specific TCR and contain a high frequency of HA-specific CD4+ T cells. Notably, autoreactive memory B cell formation occurred in TS1 × PevHA mice even though approximately half of the HA-specific CD4+ T cells were CD25+Foxp3+ cells that could significantly attenuate, but did not completely abolish HA-specific autoantibody production in an adoptive transfer setting. The findings provide evidence that a high frequency of autoreactive CD4+ T cells can be sufficient to promote autoreactive memory B cell formation in the absence of signals provided by overt immunization or infection and despite the presence of abundant autoantigen-specific CD4+CD25+Foxp3+ regulatory T cells. Memory B cell formation occurs when a subset of B cells activated during the primary immune response enters a differentiation pathway that leads to the development of germinal centers, where they undergo a complex process of somatic hypermutation, selection, and expansion of variants expressing higher affinities for the eliciting Ag (1, 2, 3). There is good evidence that signals transmitted both via the BCR and from CD4+ T cells are required for memory B cell formation (1, 2, 3). The generation of optimal memory B cell responses to foreign Ags also requires activation of the innate immune system, either by pathogens (e.g., via TLRs) or with adjuvants (4). This may reflect a role for activated dendritic cells in the development of Ab responses (5) and TLR signaling of B cells themselves may also be important in this process (6). However, somatic hypermutation can also occur in B cells recognizing self-Ags; although the presence of somatic mutations provides evidence that these autoreactive B cells have undergone memory formation, much less is known about the processes and signals that are required for autoreactive memory B cell formation than is the case for foreign Ags. The formation of somatically mutated autoantibodies can occur despite numerous processes that could potentially prevent their production. Autoreactive B cells can be subjected to negative selection from the primary B cell repertoire either by deletion (7, 8) or by receptor editing (9, 10, 11). However, this process is not complete and B cells expressing autoreactive specificities can be found in the peripheral B cell repertoire of healthy individuals (11, 12, 13, 14). B cells expressing autoreactive specificities can be actively regulated by anergy induction (15, 16) or follicular exclusion (11, 17, 18) and can be negatively selected during memory formation by a dominant, B cell-intrinsic process (19). The induction of CD4+ T cell tolerance to self-Ags can also be important in preventing autoantibody formation because autoreactive B cells can in some settings be driven to produce autoantibodies by provision of CD4+ T cell help (20, 21, 22, 23). Recent studies have shown that CD4+CD25+ regulatory T cells may also contribute to preventing autoantibody production (20, 24, 25). Yet, somatically mutated autoantibodies are characteristic of some autoimmune diseases (26, 27, 28), and the processes that can cause and/or permit autoreactive B cells to form somatically mutated autoantibodies despite these various mechanisms remain to be defined. We have been using transgenic mice expressing the influenza virus hemagglutinin (HA)4 as a model self-Ag (HA transgenic (Tg) mice) to examine how autoreactive B cell responses are regulated at different stages of their development. Using virus immunization to induce the formation of HA-specific B cells, we have shown that a population of IgG-secreting B cells that dominates primary Ab responses to the PR8 HA in virus-immunized BALB/c mice is negatively selected due to its autoreactivity in HA Tg mice (19, 29). However, a separate population of B cells that participates in both primary and memory responses of virus-immunized BALB/c mice persists in HA Tg mice, and can be activated to generate primary Ab responses by virus immunization (19, 29). Interestingly, the subsequent fate of these autoreactive HA-specific B cells can differ dramatically in different HA Tg lineages; in HA104 mice (which express HA driven by an SV40 promoter/enhancer), memory responses to secondary virus immunization were comparable to those of BALB/c mice, indicating that PR8 HA-specific B cells could undergo memory formation despite overt autoreactivity (30). By contrast, PR8 HA-specific B cells were subjected to negative selection during memory formation in HACII mice, which express high levels of PR8 HA driven by an MHC class II promoter, including by B cells themselves (19). These studies indicated that specificity for a self-Ag can prevent autoreactive memory B cells that evade negative selection from the primary B cell repertoire from maturing into memory B cells, but that the ability to mediate this form of negative selection can be influenced by the amount and/or cell type in which a self-Ag is expressed. In this report, we have examined an additional lineage of HA Tg mice (termed PevHA mice) for their ability to generate HA-specific Ab responses. We show that, like HA104 mice, PevHA mice do not mediate negative selection of PR8 HA-specific B cells during memory formation. Moreover, substantial PR8 HA-specific B cell responses develop spontaneously in TS1 × PevHA mice (which coexpress an HA-specific CD4+ TCR transgene) and we show that these autoreactive B cell responses exhibit many of the hallmarks of memory formation. Moreover, HA-specific memory autoantibody responses develop in TS1 × PevHA mice even though a large percentage of the HA-specific CD4+ T cells are CD25+Foxp3+ regulatory T cells. These studies show that a high frequency of autoreactive CD4+ T cells can be sufficient to promote spontaneous memory autoantibody formation, which can occur despite the presence of abundant Ag-specific CD4+CD25+ regulatory T cells. PevHA, HACII, and TS1 mice have been previously described (19, 31, 32) and were backcrossed to BALB/c mice (Harlan Sprague Dawley) at least 10 generations before use in these experiments. All mice were maintained under specific pathogen-free conditions using sterile microisolators at The Wistar Institute Animal Facility. Non-Tg mice refers to both nontransgenic littermates of PevHA mice and BALB/c mice, which in numerous experiments have yielded equivalent HA-specific Ab responses following virus immunization. Both male and female mice used in these experiments, and were 8–16 wk of age unless otherwise noted. All animal studies were performed under protocols approved by the Wistar Institutional Animal Care and Use Committee. Influenza viruses PR8 (A/Puerto Rico/8/34), T3 (Ref. 33 ; both H1 subtype) and J1 (a reassortant of PR8 containing the serologically non-cross-reactive H3 subtype HA; Refs. 34 and 35) were grown in the allantoic cavity of 10-day-old fertilized chicken eggs, purified by sucrose gradient centrifugation, and titered by chicken RBC agglutination (36). To induce primary B cell responses, mice were immunized i.v. (tail vein) with 1000 hemagglutinating units (HAU) of T3 virus (37) diluted in 0.2 ml of PBS and sacrificed 5 days later. For secondary B cell responses, mice were primed i.p. with 1000 HAU of T3 virus and, after at least 4 wk, boosted i.v. with 1000 HAU of T3 virus in 0.2 ml of PBS and sacrificed 3 days later. Virus specific ELISPOTs were done using purified T3, PR8, and J1 viruses as immunoadsorbents as described previously (29). Briefly, splenocytes were plated in duplicate in 0.2 ml of RPMI 1640 plus 10% FCS at 1 × 106, 2.5 × 105, 6.25 × 104, and 1.25 × 104 cells/well for 4 h at 37°C and bound Ab detected with alkaline phosphatase-conjugated goat anti-mouse IgM or IgG Ab followed by nitro-blue-tetrazolium and 5-bromo-4-chloro-3-iodolyl phosphate. Bone marrow (BM) cells or splenocytes were stained with the following Abs: anti-CD4 (clone GK 1.5; BD Pharmingen), anti-CD25 (clone PC61; BD Pharmingen), anti-CD45RB (clone RM7606; Caltag Laboratories), anti-CD62L (clone MEL-14; BD Pharmingen), anti-CD69 (clone HI.F23; BD Pharmingen), anti-CD44 (clone IM7; BD Pharmingen), biotin-anti-clonotypic TS1 TCR Ab, 6.5 (35), and biotin-anti-HA Ab, B62-82 (19). Biotin-conjugated Abs were detected with streptavidin-allophycocyanin (BD Pharmingen). Four-color cytometry was performed on a FACScan flow cytometer (BD Biosciences). Data analysis of at least 50,000 events was performed using CellQuest (BD Biosciences). For purification of cells by flow cytometry, samples were sorted to ∼95% purity at The Wistar Institute’s sorting facility using a MoFlo and Summit software (DakoCytomation). ELISAs were done using T3, PR8, and J1 viruses as immunoadsorbents as described previously (29), using AP-conjugated goat Abs to mouse IgM, total IgG, IgG1, IgG2a, IgG2b, or IgG3 (Southern Biotechnology Associates) and p-nitrophenyl phosphate to detect reactivity based on absorbances at 405 nm/650 nm. Hybridomas were generated from splenocytes from T3-immunized PevHA mice 5 days after primary immunization and TS1 × PevHA mice 3 days after primary immunization by fusion with Sp2/0-Ag14 cells and selection with hypoxanthine-azaserine (Sigma-Aldrich) as described previously (29). Hybridoma supernatants were screened by ELISA for reactivity with T3 and J1 viruses and those hybridomas that displayed >3-fold higher reactivity with T3 than J1 were expanded and screened for specificity for T3, PR8, and J1 viruses as previously described (29). In the hybridoma designation (e.g., 3683-5), the prefix refers to the mouse (e.g., mouse 3683) and the suffix denotes the individual hybridoma cell line (e.g., hybridoma 5). Sequence analysis of hybridoma L chain V region mRNAs was performed as described previously (29). Briefly, mRNA was isolated from ∼106 hybridoma cells and reverse transcribed using the Cκ constant chain-specific primer Cκ1 under standard conditions and PCR was conducted on the resulting cDNA using Cκ1 and VκC4- or VκC12-specific primers to amplify C4 or C12 clonotype L chains. Those cDNAs that did not amplify with C4 or C12 clonotype-specific primers were next amplified with a degenerate Vκ-specific primer (L5) that can amplify a wide variety of Vκ gene groups. Amplified products were run on a 1.5% agarose gel, purified using the Compass DNA Purification kit (American Bioanalytical) and their nucleotide sequences were determined using four-color dye chemistries with the ABI 373S sequencer (PerkinElmer) at Wistar Institute Nucleic Acid Facility. The ability of serum Abs to inhibit viral agglutination of chicken RBCs by PR8 virus was measured as described previously (36). Briefly, 4 HAU of PR8 virus was incubated with 3-fold dilutions of serum and 0.5% chicken RBCs for 30 min at room temperature, and the highest serum dilution at which hemagglutination was inhibited determined. BM cells or splenocytes were stained with biotin-conjugated Abs to either mouse CD4, CD8, or B220 for 30 min on ice followed by streptavidin-conjugated MACS beads and passage over a MACS CS column according to the manufacturer’s protocol (Miltenyi Biotec). 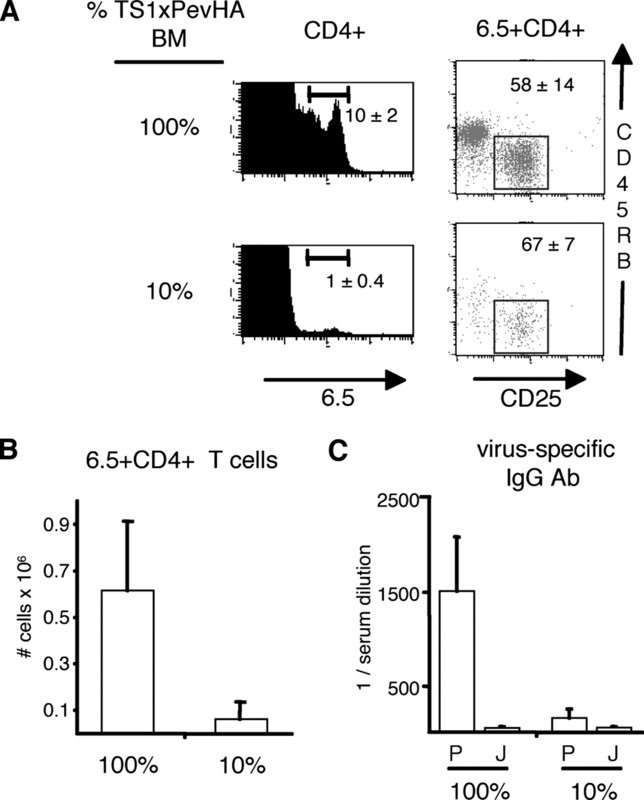 Depletion of B and T cells was confirmed by FACS using Abs to mouse IgM and CD3, respectively. Mixed BM chimeras were generated as previously described (38). Briefly, PevHA mice were lethally irradiated with 900 rad of gamma irradiation. PevHA and TS1 × PevHA donor BM cells were depleted of B and T cells by MACS using biotin-conjugated Abs to mouse B220, CD4 and CD8, and streptavidin-conjugated MACS beads. Host mice were reconstituted 1 day after irradiation with 5 × 106 total B and T cell-depleted BM cells and mice were examined 3–4 mo after BM reconstitution. PevHA mice express the influenza virus A/PR/8/34 HA (PR8 HA) as a membrane-bound neo-self-Ag under control of the human β-globin locus control region (31). To examine how tolerance to the HA as a self-Ag might affect HA-specific primary and memory B cell responses, we compared PevHA mice with non-Tg mice for their ability to generate HA-specific Ab-secreting cells (ASC) in response to virus immunization. We immunized mice with whole virus, because this allowed CD4+ T cell help to be provided to HA-specific B cells by intermolecular cognate help directed toward other non-HA viral proteins (21, 22, 39). The PR8 HA-specific ASC responses that were induced 5 days following primary immunization of PevHA mice were reduced relative to non-Tg mice; there was an ∼3-fold reduction in IgM ASC (mean frequencies 4.4 vs 15.2 ASC/105 splenocytes) and an ∼7-fold reduction in IgG ASC (mean frequencies 4.2 vs 29.9 ASC/105 splenocytes) (Fig. 1⇓A). Similarly, half as many PR8 HA-specific IgM-secreting hybridomas (4 vs 8), and one-tenth as many PR8 HA-specific IgG-secreting hybridomas (7 vs 75) were obtained from PevHA mice than from non-Tg mice 5 days after virus immunization (Fig. 1⇓B). Thus, negative selection of HA-specific B cells leads to diminished PR8 HA-specific B cell responses to virus immunization in PevHA mice, as previously described in HA104 and HACII mice (19, 29). 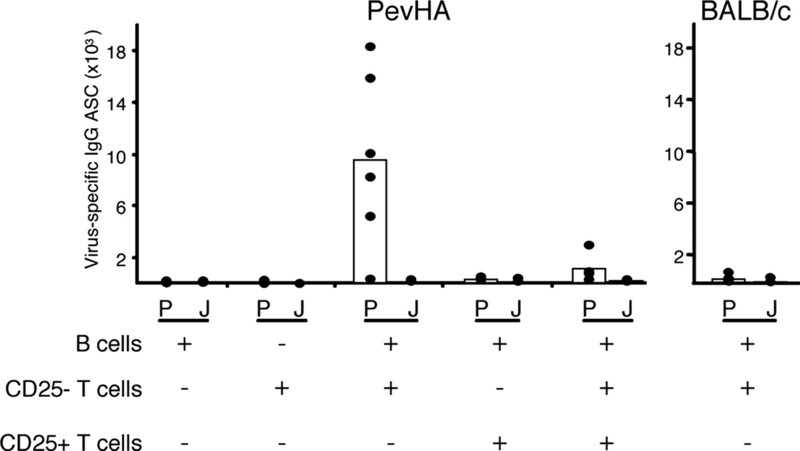 HA-specific primary and secondary Ab responses in virus-immunized PevHA mice. A, Bar graphs show the average number of PR8 HA-specific IgM and IgG ASC measured in splenocytes from non-Tg (n = 12) and PevHA mice (n = 12) by ELISPOT 5 days after primary virus immunization. Individual values for each mouse (shown as dots) were determined by subtracting the number of ASC detected with J1 from those detected with PR8 virus. B, Numbers of total hybridomas and of PR8 HA-specific IgM and IgG hybridomas obtained from non-Tg (n = 3) and PevHA (n = 3) mice 5 days after primary virus immunization. C, H chain isotype and Vκ/Jκ usage of PR8 HA-specific hybridomas obtained from non-Tg mouse 922 (29 ) and from PevHA mice 3683 and 137. Vκ gene family and Jκ gene segments used by hybridoma L chains are summarized, with gene combinations that define the C4 and C12 clonotypes shown in bold. C12 B cells use the prototypic VκC12 in conjunction with different Jκ regions (57 ), and C4 B cells use the VκC4 gene segment paired with Jκ5 (41 ). Hybridomas for which sequence data was not obtained but which were found not to use either the C4 or C12 clonotypes based on PCR analysis with C4- or C12-specific primers are indicated as (not C4, C12). D, Bar graphs show the average number of PR8 HA-specific IgM and IgG ASC measured in splenocytes from non-Tg (n = 14), and PevHA (n = 5) mice by ELISPOT 3 days after secondary virus immunization. Individual values for each mouse (shown as dots) were determined by subtracting the number of ASC detected with J1 from those detected with PR8 virus. We also examined hybridomas from PevHA mice for their usage of V region clonotypes that are associated with distinct phases of the B cell response to the HA in non-Tg mice. None of the hybridomas from PevHA mice used the C12 clonotype, which dominates hybridoma panels generated 5 days following primary immunization of non-Tg mice but does not participate in memory responses (Fig. 1⇑C) (29, 40). 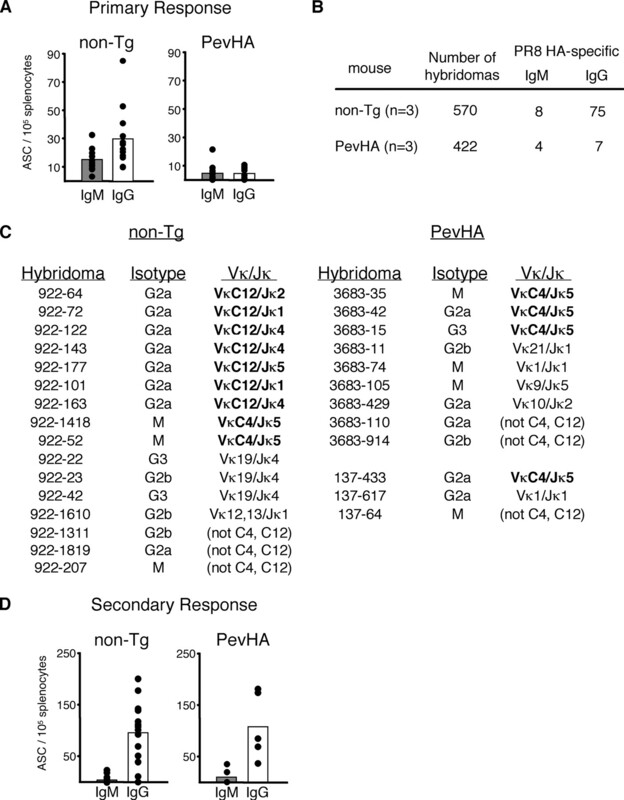 By contrast, several hybridomas from PevHA mice used the C4 clonotype, identified by the use of the prototypic VκC4/Jκ5 gene segment combination, which participates in both primary and memory B cell responses in non-Tg mice (Fig. 1⇑C) (30, 41). It was notable that three of the four hybridomas using the C4 clonotype secreted IgG Abs rather than the IgM Abs that are typically obtained after primary immunization of non-Tg mice, suggesting that C4 B cells in PevHA mice may have been preactivated by interactions with the self-HA molecule. Significantly, however, interactions with the self-HA caused the population that dominates primary Ab responses to the HA in non-Tg mice (C12 B cells) to be efficiently negatively selected in PevHA mice, as was previously observed in two other lineages of HA Tg mice (HA104 and HACII mice) (19, 29). By contrast, C4 B cells could evade negative selection and be activated from the primary repertoire, again resembling findings in HA104 and HACII mice (19, 29). We next compared PevHA and non-Tg mice for their abilities to generate HA-specific responses following secondary immunization with PR8 virus. Notably, the frequency of PR8 HA-specific IgG ASC in PevHA mice 3 days after secondary virus immunization was similar to that induced in non-Tg mice (mean frequencies 107 ASC/105 splenocytes vs 91 ASC/105 splenocytes; Fig. 1⇑D). Thus, PevHA mice resemble HA104 mice in which PR8 HA-specific memory B cell responses of virus-immunized mice are subjected to little or no negative selection by the self-PR8 HA molecule (30), and contrast HACII mice in which HA-specific B cells are negatively selected during memory formation (19). A number of factors and processes might contribute to the ability of virus immunization to promote PR8 HA-specific B cell responses in PevHA mice. First, virus immunization might provide a source of cognate help for HA-specific B cells from CD4+ T cells directed to non-HA viral proteins (21). Second, virus immunization exposes B cells to a highly immunogenic form of HA (in the form of virus particles), which could play a role in promoting the activation of B cells that have evaded negative selection by the neo-self HA (42). Third, virus immunization may promote B cell activation by provoking adjuvancy effects, e.g., through its ability to activate immune cells via TLRs (43). We were interested to determine whether the presence of autoreactive CD4+ T cells alone, in the absence of signals provided by virus immunization, could drive the activation of B cells by the neo-self HA and result in PR8 HA-specific autoantibody production. To address this question, PevHA mice were mated with TS1 mice, which express a transgenic TCR that is specific for the major I-Ed-restricted determinant of PR8 HA (termed S1); the clonotypic TCR in TS1 mice can be detected with the anti-clonotypic Ab 6.5 (32). As previously described, TS1 × PevHA mice contain similar numbers of 6.5+CD4+ T cells as are present in TS1 mice (which do not coexpress the HA self-Ag), but unlike TS1 mice, roughly half of the 6.5+CD4+T cells in TS1 × PevHA mice express a CD25+CD45RBint (Fig. 2⇓, A and B) phenotype that is characteristic of regulatory T cells (31). We also previously showed that the 6.5+CD4+CD25+, but not 6.5+CD4+CD25− T cells from TS1 × PevHA mice could suppress CD4+ T cell proliferation in vitro (31). To further characterize the 6.5+CD4+CD25+ T cells in TS1 × PevHA mice, we examined their intracellular expression of Foxp3, which is closely associated with regulatory T cell development (44). Indeed, the 6.5+CD4+CD25+ T cells in TS1 × PevHA mice were heavily enriched for Foxp3 expression (Fig. 2⇓C). By contrast, the 6.5+CD4+CD25− T cells were mostly Foxp3−, and although their CD44, CD62L, and CD45RB levels did not differ, roughly twice as many of the 6.5+CD4+CD25− T cells in TS1 × PevHA mice were CD69+ than in TS1 mice (Fig. 2⇓D), suggesting that a subset of the 6.5+CD4+CD25− T cells may have become activated in TS1 × PevHA mice. 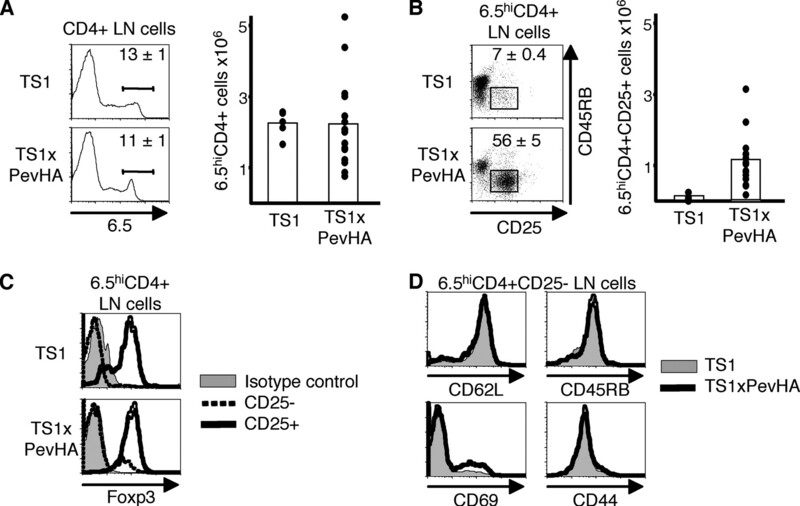 TS1 × PevHA mice contain abundant HA-specific CD4+ T cells. A, Histograms show 6.5 staining of CD4+ lymph node (LN) cells from TS1 and TS1 × PevHA mice with percentages that are 6.5+ indicated. Bar graphs show average numbers of 6.5+CD4+ LN cells in TS1 and TS1 × PevHA mice, with individual mice indicated as dots. B, Dot plots show CD25 and CD45RB staining of 6.5+CD4+ LN cells from TS1 and TS1 × PevHA mice, with percentages that are CD25+CD45RBint indicated. Bar graphs show average numbers of 6.5+CD4+CD25+ LN cells in TS1 and TS1 × PevHA mice, with individual mice indicated as dots. C, Histograms show intracellular Foxp3 staining of 6.5+CD4+CD25+ and 6.5+CD4+CD25− LN cells from TS1 and TS1 × PevHA mice. D, Histograms show expression of CD62L, CD45RB, CD69, and CD44 on 6.5+CD4+CD25− LN cells from TS1 and TS1 × PevHA mice. Significantly, sera from TS1 × PevHA mice (but not from TS1 or PevHA mice) contained high titers of PR8 virus-specific IgG Abs, which were comparable to those of BALB/c mice that had been primed and boosted with PR8 virus to induce antiviral memory responses (Fig. 3⇓A). These PR8-specific IgG Abs were detectable in sera from TS1 × PevHA mice as early as 6 wk of age (Fig. 3⇓B). Moreover, the sera from TS1 × PevHA mice exhibited very little reactivity with J1 virus (a reassortant virus which contains all of the components of PR8 except a serologically non-cross-reactive H3 subtype HA molecule; Ref. 35) (Fig. 3⇓A). By contrast, sera from PR8 virus-immune BALB/c mice exhibited substantial reactivity with J1 virus, reflecting the presence of Abs that can react with non-HA viral components such as nucleoprotein (Fig. 3⇓A). Thus, the abundant PR8 HA-specific CD4+ T cells in TS1 × PevHA mice led to the formation of an anti-PR8 HA Ab response that was of comparable magnitude to the anti-HA memory Ab responses induced by virus immunization of BALB/c mice. Naive TS1 × PevHA mice contain PR8 HA-specific serum Abs. A, Bar graphs show the average PR8 (P)- and J1 (J)-specific IgG serum Ab titers of naive BALB/c (n = 6), TS1 (n = 8), PevHA (n = 6), TS1 × PevHA (n = 10) mice, and PR8-primed BALB/c mice 28 days after virus immunization (n = 6). B, PR8-specific IgG serum Ab titers in 6- (n = 2), 8- (n = 3), 9- (n = 1), 11- (n = 2), and 14- (n = 1) wk-old TS1 × PevHA mice. Serum Ab titers were determined as the highest dilution at which serum reacted with virus 3-fold above background in an ELISA. PR8-specific IgG Ab was undetectable in serum from 8-wk-old BALB/c mice in this assay (data not shown). C, HACII and BALB/c BM cells were incubated with either TS1 × PevHA (thick solid line) or BALB/c (dotted line) serum and then stained with biotinylated anti-HA mAb B62–82. Histograms show detection of PR8 HA on B220+ cells from HACII and BALB/c mice by flow cytometry. Data are representative of two independent experiments. We wanted to directly examine whether the PR8 HA-specific Abs that arise in TS1 × PevHA mice can recognize the HA as it is expressed as a self-Ag by living cells. Accordingly, we tested sera from TS1 × PevHA mice for their ability to bind to the PR8 HA expressed by B cells from HACII mice, which express the PR8 HA at high levels that are readily detectable by flow cytometry (19). Indeed, preincubation with sera from TS1 × PevHA mice inhibited the binding of a PR8 HA-specific mAb to B cells from HACII mice, whereas sera from naive BALB/c mice did not exert this effect (Fig. 3⇑C). This demonstrates that the PR8 HA-specific Abs that develop in TS1 × PevHA mice can bind cells expressing the HA as a self-Ag and excludes the possibility that these Abs are directed to forms of the HA that are expressed by nonliving cells (e.g., apoptotic bodies) in TS1 × PevHA mice. Because we had found that HA-specific memory B cell formation could occur in virus-immunized PevHA mice, we wanted to examine whether the presence of HA-specific CD4+ T cells might be promoting PR8 HA-specific memory B cell formation in TS1 × PevHA mice. Accordingly, we first analyzed splenocytes and BM cells from unimmunized TS1 × PevHA mice for the presence of PR8 HA-specific IgG ASC by ELISPOT. PR8 HA-specific IgG ASC were detectable in the spleen and BM of TS1 × PevHA mice (Fig. 4⇓A). Indeed, they were as abundant in the BM of unimmunized TS1 × PevHA mice as they were in BALB/c mice 30 days after primary immunization with PR8 virus (average frequencies 5.5 vs 4.4 ASC/105 BM cells, respectively; Fig. 4⇓A). The migration of ASC to the BM is a feature of B cell memory formation in immune responses to foreign Ags (45). Spontaneous PR8 HA-specific B cell memory formation in TS1 × PevHA mice. A, Bar graphs show the average number of PR8 (P)- and J1 (J)-specific IgG ASC measured in the spleen (left panels) and BM (right panels) of naive TS1 (n = 6) and TS1 × PevHA mice (n = 12), and in virus-primed BALB/c mice 30 days after virus immunization (n = 9). B, Bar graphs show the average number of T3 (T)-, PR8 (P)-, and J1 (J)-specific IgG ASC measured in splenocytes from naive BALB/c (n = 4), PevHA (n = 4), TS1 (n = 5), and TS1 × PevHA mice (n = 6) 3 days after primary virus immunization, and in virus-primed BALB/c mice (n = 5) 3 days after secondary immunization. Each dot represents an individual mouse. Another hallmark of memory formation is the ability to generate accelerated IgG Ab responses upon exposure to a serologically cross-reactive Ag (46). We found that no HA-specific IgG ASC were detectable by ELISPOT analysis of splenocytes obtained from BALB/c, PevHA or TS1 mice 3 days after virus immunization (Fig. 4⇑B). By contrast, PR8-reactive IgG ASC were readily detectable in splenocytes from TS1 × PevHA mice 3 days after virus immunization and were >50-fold more abundant than in splenocytes from naive TS1 × PevHA mice (Fig. 4⇑). These PR8-reactive IgG ASC were HA specific, because no reactivity was found with the reassortant J1 virus which contains a serologically non-cross-reactive HA molecule. Together, then, the presence of PR8 HA-specific IgG ASC in the BM of TS1 × PevHA mice and the accelerated responses to virus immunization are consistent with the spontaneous formation of PR8 HA-specific memory B cells in TS1 × PevHA mice. We also examined the fine specificity of the Ab response that was induced by virus immunization of TS1 × PevHA mice. Because the T3 virus used to immunize mice contains a mutation in a B cell epitope relative to the PR8 HA, the ASC generated by immunization of BALB/c mice with T3 virus contain a fraction that react with T3 but not with PR8 (because they recognize the altered epitope; Ref. 37) (Fig. 4⇑B). In contrast, the IgG ASC induced in T3-immunized TS1 × PevHA mice were equally reactive with the T3 and PR8 HA molecules (Fig. 4⇑B), resembling the phenomenon of original antigenic sin in which memory responses to cross-reactive influenza virus variants are focused toward epitopes recognized in the HA molecule that was encountered in the first immunization (in this case, the self-PR8 HA molecule) (36). In this regard too, then, the Ab responses of TS1 × PevHA mice display characteristics of memory responses. B cell memory formation is typically accompanied by hypermutation of Ig V region genes (1, 2, 3) and we examined whether PR8 HA-specific B cells from TS1 × PevHA mice exhibited evidence of somatic mutation. We focused this analysis on hybridomas expressing the C4 clonotype, because these hybridomas are typically isolated as unmutated B cells following primary virus immunization, and as somatically mutated Abs following secondary virus immunization (29, 30, 41). Consistent with these previous studies, C4 hybridomas obtained from PevHA mice (that do not coexpress the TS1 transgene) 5 days following virus immunization expressed the C4 clonotype in unmutated form (Fig. 5⇓A). By contrast, C4 B cell hybridomas obtained from TS1 × PevHA mice 3 days after virus immunization in each case exhibited differences from the germline VκC4 germline sequence that were most likely the result of somatic mutation (Fig. 5⇓A). We also examined the Igκ V region gene sequences of eight other PR8 HA-specific IgG-secreting hybridomas generated from TS1 × PevHA mice that do not use the C4 clonotype and compared these sequences to the germline Vκ gene sequences that have previously been reported (47, 48). The hybridomas all contained at least one, and up to nine, difference from known germline gene segments, which again were most likely the result of somatic hypermutation (Fig. 5⇓B). PR8 HA-specific B cells undergo somatic mutation and affinity maturation in TS1 × PevHA mice. A, L chain amino acid sequences of hybridomas using the C4 clonotype from PR8 HA-specific hybridomas generated from PevHA mice 5 days after primary virus immunization or TS1 × PevHA mice 3 days after primary virus immunization. Dashes represent identity with the canonical VκC4/Jκ5 sequence. The sequences of these Ab Vκ regions are available from GenBank under accession numbers DQ125307-DQ125309, DQ125312, and DQ125314-DQ125316. B, Graph indicates the number of nucleotide differences between Vκ mRNA sequences of PR8 HA-specific IgM and IgG-secreting hybridomas from PevHA and TS1 × PevHA and previously reported Vκ germline gene sequences (47 ,48 ). Each dot represents an individual hybridoma. C, Graphs show the binding of purified C4 IgG Abs from PevHA mice (hybridomas 3683-15, 3683-42, 137-433) (•), and from TS1 × PevHA mice (hybridomas 5656-6, 5656-8, 9740-438) (□) to PR8 virus in an ELISA. D, Graph shows HI activity of sera from unimmunized TS1 and TS1 × PevHA mice and from BALB/c mice 30 days after virus immunization. Bars indicate the average highest dilution that inhibited RBC agglutination by PR8 virus; dots represent individual mice. Somatic mutation is associated with affinity maturation of Ab responses (1, 2, 3), and we purified C4 Abs from hybridomas obtained from PevHA mice following primary immunization (which express unmutated IgG Abs) and compared them with the mutated C4 Abs from TS1 × PevHA mice for their reactivity with PR8 virus in an ELISA. The mutated C4 Abs were 100- to 1000-fold more reactive with PR8 virus, indicating that they possessed higher affinities for the PR8 HA (Fig. 5⇑C). We also examined the ability of sera from TS1 × PevHA mice to react with the PR8 HA in a HI assay, which requires that serum Abs interact with conformational determinants on the HA with sufficient avidity to inhibit binding to sialic acid residues on RBC (36). The HI titers of sera from TS1 × PevHA mice were comparable to sera from BALB/c mice that had been primed and boosted with PR8 virus and that are representative of an Ab response that has undergone affinity maturation in response to a viral Ag (Fig. 5⇑D). Collectively, then, these data provide strong evidence that PR8 HA-specific B cells undergo somatic mutation and affinity maturation in response to the self-HA molecule in TS1 × PevHA mice. It was noteworthy that the presence of 6.5+CD4+ T cells in TS1 × PevHA mice promoted the formation of high titers of PR8 HA-specific IgG Abs, even though approximately half of the 6.5+CD4+ T cells are CD25+Foxp3+ Treg cells. We therefore wanted to examine whether these cells could suppress the generation of anti-HA Ab responses in vivo, because it was possible that they might not be able to regulate in vivo Ab responses despite their ability to suppress T cell proliferation in vitro (31). Accordingly, we used a previously described adoptive transfer approach to induce Ab responses to the PR8 HA as a self-Ag in PevHA mice (30). CD4+ T cell-depleted splenocytes from PR8 virus-primed BALB/c mice were used as a source of HA-specific B cells, and transferred into PevHA mice either alone, or with CD4+CD25− and/or CD4+CD25+ T cells purified from TS1 × PevHA mice. Five days after transfer, splenocytes from recipient mice were analyzed for the frequency of PR8- and J1-specific ASC by ELISPOT. PR8-specific ASC were undetectable in the spleens of PevHA mice that received only HA-specific B cell-enriched splenocytes or CD4+CD25− T cells (Fig. 6⇓). However, the spleens of PevHA mice receiving both HA-specific B cell-enriched splenocytes and CD4+CD25− T cells contained on average 9.4 × 103 PR8 virus-specific IgG ASC (Fig. 6⇓); these ASC were PR8 HA-specific, because no reactivity was observed with J1 virus. The formation of these ASC also depended on in vivo activation by the neo-self PR8 HA, because no PR8 HA-specific ASC were detected in BALB/c mice that received B cell-enriched splenocytes and CD4+CD25− T cells (Fig. 6⇓). Far fewer PR8 HA-specific ASC were induced when CD4+CD25+ T cells were transferred with the HA-specific B cell-enriched splenocytes into PevHA mice (on average, 0.1 × 103 splenic ASC; Fig. 6⇓). Moreover, when equal numbers of CD4+CD25+ T cells were transferred with CD4+CD25− T cells and HA-specific B cell-enriched splenocytes into PevHA mice, the number of HA-specific ASC was substantially reduced relative to mice that did not receive CD4+CD25+ T cells (on average, 1 × 103 vs 9.4 × 103 splenic ASC, respectively; p = 0.006; Fig. 6⇓). Interestingly, even though the frequencies of PR8 HA-specific ASC were lower in mice that received CD4+CD25+ T cells, the frequencies of ASC directed to PR8 virus were higher than to J1 virus, indicating that some PR8 HA-specific ASC formation had occurred. Thus, when present as a coequal mixture (as is the case in intact TS1 × PevHA mice), the CD4+CD25+ T cells from TS1 × PevHA mice could suppress, but did not completely abolish, the formation of PR8 HA-specific ASC in response to the self-HA molecule in vivo. CD4+CD25+ T cells from TS1 × PevHA mice can suppress anti-self Ab responses in vivo. Graph shows the number of PR8 (P)- and J1 (J)- specific IgG splenic ASC in PevHA mice (left panel) and BALB/c mice (right panel) 5 days after receiving 1.5 × 107 PR8-primed BALB/c B cells, 2 × 106 TS1 × PevHA CD4+CD25− T cells, or 2 × 106 TS1 × PevHA CD4+CD25+ T cells either alone or in combination, as indicated. Bars show the average number of ASC and dots represent individual mice. In an effort to understand how TS1 × PevHA mice can contain high titers of HA-specific IgG Abs despite the presence of CD4+CD25+ regulatory T cells that are able to suppress HA-specific Ab responses, we examined the possibility that the high frequency of 6.5+CD4+ T cells (both CD25− and CD25+) in these mice was helping to promote anti-HA Ab formation. Accordingly, we generated BM chimeras in which BM from TS1 × PevHA mice was used to reconstitute irradiated PevHA mice either alone, or after being mixed with a 9-fold excess of BM cells from PevHA mice. Mice reconstituted with 100% TS1 × PevHA BM cells resembled intact TS1 × PevHA mice with respect to the percentages of CD4+ cells that were 6.5+, and that expressed the 6.5+CD4+CD25+CD45RBint phenotype that is characteristic of regulatory T cells in TS1 × PevHA mice (31) (Fig. 7⇓, A and B). In the chimeric mice receiving 10% TS1 × PevHA BM cells, the representation of 6.5+ cells among CD4+ T cells was correspondingly reduced, and in this case too, roughly equal numbers of the 6.5+CD4+ T cells were CD25+CD45RBint vs CD25−CD45RBhigh (Fig. 7⇓, A and B). Strikingly, the levels of PR8 HA-specific Ab in serum samples from these chimeric mice showed a close concordance with the number of 6.5+CD4+ T cells that were present; indeed, both the average titers of PR8 HA-specific Ab and the frequencies of 6.5+CD4+ T cells were ∼10-fold lower in the chimeras that had received 10% TS1 × PevHA BM than in the 100% TS1 × PevHA chimeras (Fig. 7⇓C). It is also noteworthy that although the anti-PR8 reactivity of serum from the 10% PevHA chimeras was substantially lower than that of the 100% PevHA chimeras, it nevertheless exceeded the reactivity exhibited to J1 virus, suggesting that reducing the frequency of 6.5+CD4+ T cells decreased but did not abolish the formation of PR8 HA-specific Abs (Fig. 7⇓C). Thus, the formation of HA-specific autoantibodies in TS1 × PevHA mice was diminished by reducing by the frequency of 6.5+CD4+ T cells. Reduced HA-specific Ab titers in BM chimeras containing decreased HA-specific CD4+ T cell frequencies. A, Histograms show levels of anti-clonotypic TCR (6.5) expression on CD4+ LN cells isolated from irradiated PevHA mice reconstituted with either a 100:1 (“100%”) or 10:90 (“10%) mixture of TS1 × PevHA:PevHA BM (in each case n = 4). The percentage of CD4+ cells bearing the 6.5+ TCR is shown. Dot plots show levels of CD25 vs CD45RB vs on 6.5+CD4+ LN cells from the chimeric mice, with the percentage of CD25+CD45RBint cells within the 6.5+CD4+ T cell population indicated. B, Bar graphs show the average number of 6.5+CD4+ and 6.5+CD4+CD25+ LN cells in irradiated PevHA mice reconstituted with either a 100:1 (”100%“) or 10:90 (”10%) mixture of TS1 × PevHA:PevHA BM (in each case n = 4). C, Bar graphs show the average levels of PR8 (P) and J1 (J) virus-specific IgG serum Ab irradiated PevHA mice reconstituted with either a 100:1 (“100%”) or 10:90 (“10%) mixture of TS1 × PevHA:PevHA BM (in each case n = 4). Serum Ab titers were determined as the highest dilution at which serum reacted with virus at a level 3-fold above background in an ELISA. The studies here have examined processes that can give rise to the formation of somatically mutated, high-affinity autoantibodies in transgenic mice expressing the PR8 HA as a membrane-bound self-Ag. By using virus immunization to induce B cell responses, we showed that PR8 HA-specific memory B cell responses are not subjected to negative selection during memory formation in PevHA mice. Indeed, virus-immunized PevHA mice generated PR8 HA-specific memory B cell responses that were of comparable magnitude to those induced in BALB/c mice. PR8 HA-specific memory B cell formation also occurred spontaneously in TS1 × PevHA mice, which contain abundant PR8 HA-specific CD4+ T cells (including CD4+CD25+ regulatory T cells). The findings show that a high frequency of autoreactive CD4+ T cells is sufficient to drive the formation of high-affinity anti-self memory B cell responses in the absence of other stimuli (such as high Ag concentrations or adjuvancy effects) that might be provided by immunization with a foreign Ag. The findings here extend previous studies showing that separate populations of PR8 HA-specific B cells can differ in their sensitivities to negative selection from the primary vs memory B cell repertoires of HA Tg mice. We previously showed that a population of HA-specific IgG-secreting B cells that uses a characteristic clonotype (termed C12) and dominates primary immune responses to BALB/c mice is negatively selected in HA104 and HACII mice because of their specificity for the self-HA (19, 29). 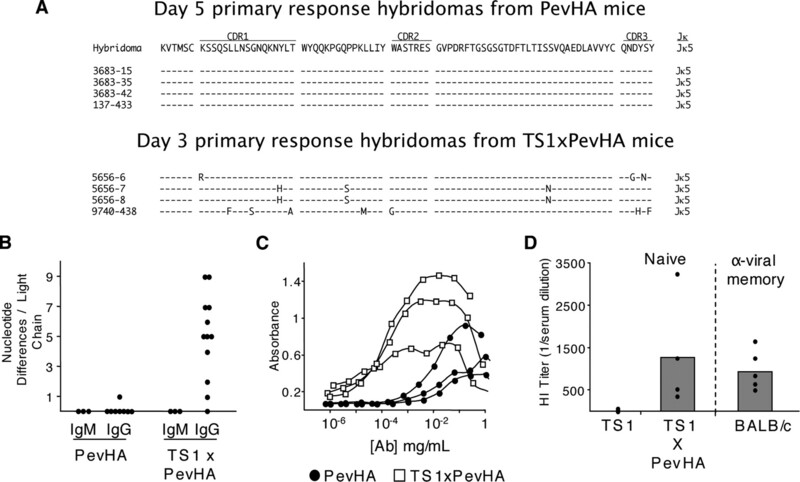 We have shown here the primary anti-HA Ab responses of PevHA mice were similarly substantially reduced and C12-bearing hybridomas could again not be obtained from virus-immunized PevHA mice. HA104 and HACII mice did, however, differ in their abilities to mediate negative selection of HA-specific B cells during memory formation; in HACII mice, HA-specific B cells that could be activated from the preimmune repertoire were prevented from participating in memory responses by a dominant, B cell-intrinsic process (19). By contrast, HA104 mice could generate HA-specific memory B cell responses in response to virus immunization that were of comparable magnitude to those induced in BALB/c mice (30). In this respect, PevHA mice closely resembled HA104 mice, because HA-specific B cells that evaded negative selection from the primary repertoire were not prevented from maturing into memory B cells. It is not clear whether these cells that evade negative selection from the primary repertoire possess “anergic” phenotypes and were rescued from anergy induction by virus immunization (49). The findings in PevHA mice are nonetheless noteworthy because they provide a second example of autoreactive B cells failing to undergo negative selection during memory B cell formation in mice expressing the PR8 HA as a membrane-bound self-Ag. Moreover, it is clear that the failure to mediate negative selection of HA-specific memory B cells is not because the HA is expressed in sites or amounts that are poorly accessible to B cells in PevHA mice, because the self-HA directed HA-specific memory B cell formation in TS1 × PevHA mice. Similarly, we previously showed that the self-HA in HA104 mice can support germinal center formation in adoptive transfer settings, indicating that the failure of the HA to mediate negative selection during memory formation in HA104 mice is not due to an inability to be recognized by germinal center B cells (30). Instead, the findings here extend the conclusion that only a subset of self-Ags (which might include those expressed at high densities on MHC class II+ cells, as is the case for HA in HACII mice) can mediate negative selection of autoreactive B cells during memory formation. The spontaneous formation of HA-specific memory B cells in TS1 × PevHA mice was indicated by the presence of PR8 HA-specific ASC in the BM, by the accelerated PR8 HA-specific IgG responses (relative to TS1 or PevHA mice) that were displayed in response to virus immunization, and by the somatic mutation and affinity maturation of PR8 HA-specific B cells. Memory B cell responses are typically associated with immune responses to foreign Ags, such as microbial agents or immunogens containing an adjuvant. In these settings, signals provided by the infectious agent or adjuvant play an important role in stimulating the immune response, for example by providing signals through TLRs (43, 50). However, PR8 HA-specific B cell memory formation occurs spontaneously in TS1 × PevHA mice, without the need to provide exogenous stimulation or adjuvants. Endogenous adjuvants might play a role in formation of HA-specific memory B cells in TS1 × PevHA mice (51). Alternatively, cytokines and/or other accessory molecules provided by 6.5+CD4+ T cells in TS1 × PevHA mice might activate dendritic cells and bypass the requirement for exogenously provided adjuvants (52). Notably, the memory responses of TS1 × PevHA mice appeared quite similar in magnitude to those generated in BALB/c mice following virus immunization, suggesting that these endogenous stimuli can support robust memory B cell responses. Indeed, unimmunized TS1 × PevHA and virus-immunized BALB/c mice contained similar PR8 HA-specific serum Ab titers and frequencies of PR8 HA-specific BM ASC. The similar magnitudes of these memory responses suggest that each process has acted to fill an available niche, consistent with conclusions that we previously drew based on analyses of the specificity of the memory B cell responses of virus-immunized HACII mice vs BALB/c mice (19). Spontaneous autoantibody formation has been described in natural, transgenic, and knockout mouse models, which have shown that mutations affecting a variety of processes can contribute to autoantibody production (53). For example, defects in apoptotic cell clearance may contribute to autoantibody production by generating elevated levels of autoantigens, while those affecting lymphocyte signaling can lead to enhanced or prolonged signaling in response to self-Ags (53). In TS1 × PevHA mice, HA-specific autoantibody formation is unlikely to be a consequence of mutations affecting Ag-presentation or signaling pathways, because HA-specific autoantibodies do not form in either TS1 or PevHA mice. We have shown that the formation of HA-specific memory autoantibodies in TS1 × PevHA mice instead depends, firstly, on the inability of the self-HA molecule to mediate negative selection of HA-specific autoantibodies during memory formation. Because HA-specific B cells can be negatively selected during memory formation in HACII mice, it is possible that the differing abilities of bona fide self-Ags to mediate this form of negative selection contributes to the targeting of somatically mutated autoantibodies to particular self-Ags that can occur in autoimmune diseases (26, 27, 28). Second, the formation of HA-specific autoantibodies in TS1 × PevHA mice was clearly dependent on the presence of abundant HA-specific CD4+ T cells, which was both sufficient and necessary to promote autoantibody formation. This resembles studies in another TCR transgenic mouse model (K/B × N) mice, which contain a high frequency of autoreactive CD4+ T cells that are specific for the self-Ag glucose-6-phosphate-isomerase, and spontaneously develop somatically mutated anti-glucose-6- phosphate-isomerase Abs (23, 54). In addition, studies in a nontransgenic mouse system found that autoreactive CD4+ T cell frequencies were enhanced >100-fold in autoimmune disease-prone (NZB × NZW)F1 mice relative to nonautoimmune B6 counterparts (55). The findings here further support the conclusion that failures to adequately eliminate or regulate CD4+ T cells that can recognize target autoantigens can be an important factor in promoting the development of autoantibody-mediated autoimmune diseases (56). Finally, it is noteworthy that HA-specific autoantibody formation occurred even though approximately half of the autoreactive 6.5+CD4+ T cells in TS1 × PevHA mice are CD25+Foxp3+ regulatory T cells. Using an adoptive transfer system, we showed that these cells are capable of suppressing Ab responses to the self PR8 HA molecule in PevHA mice, consistent with other studies showing that CD4+CD25+ regulatory T cells can suppress Ab responses (20, 24, 25). Why then do TS1 × PevHA mice contain high titers of PR8 HA-specific autoantibodies, despite the presence of abundant HA-specific CD4+CD25+ regulatory T cells? The adoptive transfer experiments showed that the activation of autoreactive B cells was greatly suppressed when CD4+CD25+ T cells were added in equal numbers to CD4+CD25− T cells. However, it is also notable that suppression was not complete, because these mice contained greater numbers of PR8 HA-specific ASC than could be detected in control mice. It also seems likely that the failure to adequately suppress HA-specific Ab formation is related to the high frequency of CD4+ T cells in TS1 × PevHA mice, because their levels were substantially lower in BM chimeras in which the frequency of 6.5+CD4+ T cells was reduced ∼10-fold relative to intact TS1 × PevHA mice. The data here provide evidence that under conditions of chronic stimulation and high-autoreactive CD4+ T cell number (such as occur in intact TS1 × PevHA mice), sufficient CD4+ T cell activity overcomes the effects of suppression to induce the development of a HA-specific Ab response. Moreover, it is significant that this activity can promote the formation of a memory B cell response to HA that is of comparable magnitude to that achieved by virus immunization. These studies also suggest that the presence of a high frequency of autoreactive CD4+ T cells, rather than the presence or absence of Ag-specific CD4+CD25+ regulatory T cells, might be a decisive factor in the formation of somatically mutated autoantibodies in diseases such as systemic lupus erythematosus or rheumatoid arthritis. We are grateful to Malinda Aitken for her invaluable assistance in maintaining mouse lineages and to Andrew Rankin for discussion. ↵1 This work was supported by AI59166, AI24541, and CA09140 from the National Institutes of Health, by the Lupus Foundation of Southeastern Pennsylvania, and by the Commonwealth Universal Research Enhancement Program, Pennsylvania Department of Health. ↵2 Current address: Inflammation, Wyeth Research, Cambridge, MA 02140. ↵4 Abbreviations used in this paper: HA, hemagglutinin; HAU, hemagglutinating unit; Tg, transgenic; BM, bone marrow; ASC, Ab-secreting cell; HI, HA inhibition. Przylepa, J., C. Himes, G. Kelsoe. 1998. Lymphocyte development and selection in germinal centers. Curr. Top. Microbiol. Immunol. 229: 85-104. Tarlinton, D. M., A. Light, G. J. Nossal, K. G. Smith. 1998. Affinity maturation of the primary response by V gene diversification. Curr. Top. Microbiol. Immunol. 229: 71-83. Manser, T., K. M. Tumas-Brundage, L. P. Casson, A. M. Giusti, S. Hande, E. Notidis, K. A. Vora. 1998. The roles of antibody variable region hypermutation and selection in the development of the memory B-cell compartment. Immunol. Rev. 162: 183-196. Pulendran, B., R. Ahmed. 2006. Translating innate immunity into immunological memory: implications for vaccine development. Cell 124: 849-863. Banchereau, J., F. Briere, C. Caux, J. Davoust, S. Lebecque, Y. J. Liu, B. Pulendran, K. Palucka. 2000. Immunobiology of dendritic cells. Annu. Rev. Immunol. 18: 767-811. Pasare, C., R. Medzhitov. 2005. Control of B-cell responses by Toll-like receptors. Nature 438: 364-368. Nemazee, D. A., K. Burki. 1989. Clonal deletion of B lymphocytes in a transgenic mouse bearing anti-MHC class I antibody genes. Nature 337: 562-566. Chen, C., Z. Nagy, M. Z. Radic, R. R. Hardy, D. Huszar, S. A. Camper, M. Weigert. 1995. The site and stage of anti-DNA B-cell deletion. Nature 373: 252-255. Gay, D., T. Saunders, S. Camper, M. Weigert. 1993. Receptor editing: an approach by autoreactive B cells to escape tolerance. J. Exp. Med. 177: 999-1008. Tiegs, S. L., D. M. Russell, D. Nemazee. 1993. Receptor editing in self-reactive bone marrow B cells. J. Exp. Med. 177: 1009-1020. Huang, H., J. F. Kearney, M. J. Grusby, C. Benoist, D. Mathis. 2006. Induction of tolerance in arthritogenic B cells with receptors of differing affinity for self-antigen. Proc. Natl. Acad. Sci. USA 103: 3734-3739. Bhat, N. M., M. M. Bieber, M. B. Spellerberg, F. K. Stevenson, N. N. Teng. 2000. Recognition of auto- and exoantigens by V4–34 gene encoded antibodies. Scand. J. Immunol. 51: 134-140. Pugh-Bernard, A. E., G. J. Silverman, A. J. Cappione, M. E. Villano, D. H. Ryan, R. A. Insel, I. Sanz. 2001. Regulation of inherently autoreactive VH4–34 B cells in the maintenance of human B cell tolerance. J. Clin. Invest. 108: 1061-1070. Wardemann, H., S. Yurasov, A. Schaefer, J. W. Young, E. Meffre, M. C. Nussenzweig. 2003. Predominant autoantibody production by early human B cell precursors. Science 301: 1374-1377. Erikson, J., M. Z. Radic, S. A. Camper, R. R. Hardy, C. Carmack, M. Weigert. 1991. Expression of anti-DNA immunoglobulin transgenes in non-autoimmune mice. Nature 349: 331-334. Goodnow, C. C., J. Crosbie, S. Adelstein, T. B. Lavoie, S. J. Smith-Gill, R. A. Brink, H. Pritchard-Briscoe, J. S. Wotherspoon, R. H. Loblay, K. Raphael, et al 1988. Altered immunoglobulin expression and functional silencing of self-reactive B lymphocytes in transgenic mice. Nature 334: 676-682. Mandik-Nayak, L., A. Bui, H. Noorchashm, A. Eaton, J. Erikson. 1997. Regulation of anti-double-stranded DNA B cells in nonautoimmune mice: localization to the T-B interface of the splenic follicle. J. Exp. Med. 186: 1257-1267. Cyster, J. G., S. B. Hartley, C. C. Goodnow. 1994. Competition for follicular niches excludes self-reactive cells from the recirculating B-cell repertoire. Nature 371: 389-395. Guay, H. M., L. Panarey, A. J. Reed, A. J. Caton. 2004. Specificity-based negative selection of autoreactive B cells during memory formation. J. Immunol. 173: 5485-5494. Seo, S. J., M. L. Fields, J. L. Buckler, A. J. Reed, L. Mandik-Nayak, S. A. Nish, R. J. Noelle, L. A. Turka, F. D. Finkelman, A. J. Caton, J. Erikson. 2002. The impact of T helper and T regulatory cells on the regulation of anti-double-stranded DNA B cells. Immunity 16: 535-546. Steinhoff, U., C. Burkhart, H. Arnheiter, H. Hengartner, R. Zinkernagel. 1994. Virus or a hapten-carrier complex can activate autoreactive B cells by providing linked T help. Eur. J. Immunol. 24: 773-776. Zinkernagel, R. M., S. Cooper, J. Chambers, R. A. Lazzarini, H. Hengartner, H. Arnheiter. 1990. Virus-induced autoantibody response to a transgenic viral antigen. Nature 345: 68-71. Matsumoto, I., A. Staub, C. Benoist, D. Mathis. 1999. Arthritis provoked by linked T and B cell recognition of a glycolytic enzyme. Science 286: 1732-1735. Zhao, D. M., A. M. Thornton, R. J. DiPaolo, E. M. Shevach. 2006. Activated CD4+CD25+ T cells selectively kill B lymphocytes. Blood 107: 3925-3932. Bystry, R. S., V. Aluvihare, K. A. Welch, M. Kallikourdis, A. G. Betz. 2001. B cells and professional APCs recruit regulatory T cells via CCL4. Nat. Immunol. 2: 1126-1132. Diamond, B., J. B. Katz, E. Paul, C. Aranow, D. Lustgarten, M. D. Scharff. 1992. The role of somatic mutation in the pathogenic anti-DNA response. Annu. Rev. Immunol. 10: 731-757. Shlomchik, M. J., A. Marshak-Rothstein, C. B. Wolfowicz, T. L. Rothstein, M. G. Weigert. 1987. The role of clonal selection and somatic mutation in autoimmunity. Nature 328: 805-811. Radic, M. Z., M. Weigert. 1994. Genetic and structural evidence for antigen selection of anti-DNA antibodies. Annu. Rev. Immunol. 12: 487-520. Caton, A. J., J. R. Swartzentruber, A. L. Kuhl, S. R. Carding, S. E. Stark. 1996. Activation and negative selection of functionally distinct subsets of antibody-secreting cells by influenza hemagglutinin as a viral and a neo-self antigen. J. Exp. Med. 183: 13-26. Reed, A. J., M. P. Riley, A. J. Caton. 2000. Virus-induced maturation and activation of autoreactive memory B cells. J. Exp. Med. 192: 1763-1774. Lerman, M. A., J. Larkin, 3rd, C. Cozzo, M. S. Jordan, A. J. Caton. 2004. CD4+CD25+ regulatory T cell repertoire formation in response to varying expression of a neo-self-antigen. J. Immunol. 173: 236-244. Caton, A. J., G. G. Brownlee, J. W. Yewdell, W. Gerhard. 1982. The antigenic structure of the influenza virus A/PR/8/34 hemagglutinin (H1 subtype). Cell 31: 417-427. Palese, P.. 1977. The genes of influenza virus. Cell 10: 1-10. Palese, P., J. L. Schulman. 1976. Mapping of the influenza virus genome: identification of the hemagglutinin and the neuraminidase genes. Proc. Natl. Acad. Sci. USA 73: 2142-2146. Fazekas de St. Groth, S., R. G. Webster. 1966. Disquisitions of original antigenic sin. I. Evidence in man. J. Exp. Med. 124: 331-345. Stark, S. E., A. J. Caton. 1991. Antibodies that are specific for a single amino acid interchange in a protein epitope use structurally distinct variable regions. J. Exp. Med. 174: 613-624. Scherle, P. A., W. Gerhard. 1986. Functional analysis of influenza-specific helper T cell clones in vivo: T cells specific for internal viral proteins provide cognate help for B cell responses to hemagglutinin. J. Exp. Med. 164: 1114-1128. Kavaler, J., A. J. Caton, L. M. Staudt, W. Gerhard. 1991. A B cell population that dominates the primary response to influenza virus hemagglutinin does not participate in the memory response. Eur. J. Immunol. 21: 2687-2695. Clarke, S. H., L. M. Staudt, J. Kavaler, D. Schwartz, W. U. Gerhard, M. G. Weigert. 1990. V region gene usage and somatic mutation in the primary and secondary responses to influenza virus hemagglutinin. J. Immunol. 144: 2795-2801. Bachmann, M. F., U. H. Rohrer, T. M. Kundig, K. Burki, H. Hengartner, R. M. Zinkernagel. 1993. The influence of antigen organization on B cell responsiveness. Science 262: 1448-1451. Bowie, A. G., I. R. Haga. 2005. The role of Toll-like receptors in the host response to viruses. Mol. Immunol. 42: 859-867. Slifka, M. K., M. Matloubian, R. Ahmed. 1995. Bone marrow is a major site of long-term antibody production after acute viral infection. J. Virol. 69: 1895-1902. Welsh, R. M., L. K. Selin, E. Szomolanyi-Tsuda. 2004. Immunological memory to viral infections. Annu. Rev. Immunol. 22: 711-743. Kirschbaum, T., S. Pourrajabi, I. Zocher, J. Schwendinger, V. Heim, F. Roschenthaler, V. Kirschbaum, H. G. Zachau. 1998. The 3′ part of the immunoglobulin κ locus of the mouse. Eur. J. Immunol. 28: 1458-1466. Thiebe, R., K. F. Schable, A. Bensch, J. Brensing-Kuppers, V. Heim, T. Kirschbaum, H. Mitlohner, M. Ohnrich, S. Pourrajabi, F. Roschenthaler, et al 1999. The variable genes and gene families of the mouse immunoglobulin κ locus. Eur. J. Immunol. 29: 2072-2081. Goodnow, C. C., R. Brink, E. Adams. 1991. Breakdown of self-tolerance in anergic B lymphocytes. Nature 352: 532-536. Pasare, C., R. Medzhitov. 2005. Toll-like receptors: linking innate and adaptive immunity. Adv. Exp. Med. Biol. 560: 11-18. Shi, Y., J. E. Evans, K. L. Rock. 2003. Molecular identification of a danger signal that alerts the immune system to dying cells. Nature 425: 516-521. Gallucci, S., M. Lolkema, P. Matzinger. 1999. Natural adjuvants: endogenous activators of dendritic cells. Nat. Med. 5: 1249-1255. Shlomchik, M. J., J. E. Craft, M. J. Mamula. 2001. From T to B and back again: positive feedback in systemic autoimmune disease. Nat. Rev. Immunol. 1: 147-153. Maccioni, M., G. Zeder-Lutz, H. Huang, C. Ebel, P. Gerber, J. Hergueux, P. Marchal, V. Duchatelle, C. Degott, M. van Regenmortel, et al 2002. Arthritogenic monoclonal antibodies from K/BxN mice. J. Exp. Med. 195: 1071-1077. Busser, B. W., M. P. Cancro, T. M. Laufer. 2004. An increased frequency of autoantibody-inducing CD4+ T cells in pre-diseased lupus-prone mice. Int. Immunol. 16: 1001-1007. Marrack, P., J. Kappler, B. L. Kotzin. 2001. Autoimmune disease: why and where it occurs. Nat. Med. 7: 899-905. Kavaler, J., A. J. Caton, L. M. Staudt, D. Schwartz, W. Gerhard. 1990. A set of closely related antibodies dominates the primary antibody response to the antigenic site CB of the A/PR/8/34 influenza virus hemagglutinin. J. Immunol. 145: 2312-2321.